Ernie Ball has premiered a brand new mini-documentary film, Unspoken Expression, starring legendary guitarist Slash. You can watch it below. 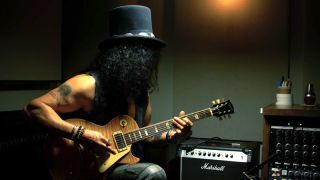 Filmed inside Slash's private studio and creative haven, Unspoken Expression delves into the rock icon's playing, early inspirations, and how the guitar is the conduit for his creativity and passion.